Catherine’s best friend, Elizabeth, uses crutches and braces to walk. Sometimes she uses a wheelchair. If you look closely at the illustrations in Catherine’s Pascha, you’ll see that she’s not the only person in the parish with a visible disability. You rarely see disabled characters in picture books, and that’s a problem. 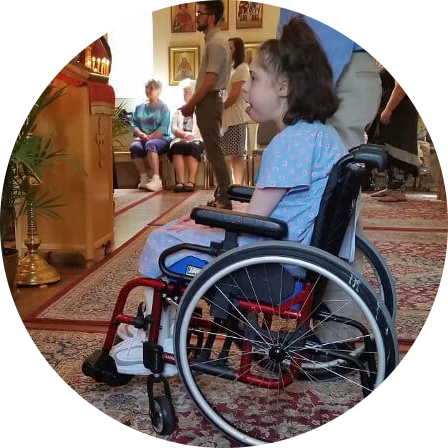 And you rarely see people with disabilities in Orthodox churches, and that’s a bigger problem. Many of our churches have architectural barriers that prevent people who use wheelchairs from attending. But physical barriers are easily dealt with. It just takes time and money. The more difficult barriers are the barriers caused by other people’s attitudes and expectations. These barriers of the heart can be overcome, too. It might seem obvious: a disability is a condition that makes it difficult to see, hear, move, or take care of yourself. It’s not just about wheelchairs. There are many conditions that can result in disability, and many different ways they can affect a person. Some conditions, like the loss of a leg in an automobile accident, don’t change much over time. Some, like multiple sclerosis, get worse over time. Some conditions, like migraine disorder or Meniere’s disease, have symptoms that vary from day to day. Someone with these conditions may seem to be just fine one day, and not at all fine another day. Some conditions are invisible to other people. You can’t tell by looking that someone has autism or Ehlers Danlos syndrome. You can’t see PTSD or fibromyalgia or celiac disease. Most impairments are not all-or-nothing. For example, someone who is blind may have what’s called tunnel vision. They can see clearly straight ahead in a small area. They can look you in the eye and read regular print. But they have limited or no peripheral vision and so use a white cane or a guide dog to walk safely. Others may have poor central vision, so they can’t see faces clearly or read print. But they have typical peripheral vision and can walk about easily with no aids. Yet others may only see light and shadow, see only on one side, or have spotty “blind patches” in their visual field. The same condition can be more or less disabling depending on the circumstances. For example, suppose your knee was injured in a way that makes it difficult or impossible to climb stairs. That condition is a serious disability if you live and work in multistory buildings that don’t have elevators. If you live in a single-story house, though, and don’t encounter stairs in your everyday life, it might not be much of a disability at all. I asked people with disabilities what they would like to say to their church, if they could say just one thing. So when you go to coffee hour, grab a cup of coffee and look around for the person who has a disability or a chronic illness. Smile. Say hello. Chat with them for a while. Unless you already know them well, it’s safe to assume that they’d rather talk about something other than their condition. If you’re not sure what to talk about, try talking about the homily, the saint of the day, or the weather. Pretty much the same things you’d talk about with anyone else. If the person is using a wheelchair, sit down so that you’re at their eye level. If you’re standing, don’t lean down as you would to a child. Instead, back up until you and they can look at each other comfortably. If the person is blind or has low vision, identify yourself and anyone who is with you. Let them know when you move, or when someone else joins you. Tell them when you leave. If the person is deaf or hard of hearing, be sure you face them, and don’t shout. If the deaf person signs, and you can sign even a little, by all means, sign! If you don’t sign, ask if you should speak or write to them. If the person speaks slowly or with difficulty, be patient. Don’t pretend you understand what they’ve said if you don’t. Ask them to repeat what they said, or ask if they would write it down for you. A deaf friend said, “Sometimes people treat me as if I’m stupid because I don’t respond quickly.” Autistic people often have the same complaint – other people won’t give them the time they need to process language and put their response into words. Give them time. Don’t talk about how inspiring or brave or special a person with disabilities is. Don’t tell the parents of a child with disabilities that God gave them a special child because they’re such special parents. While you mean to be encouraging, many people don’t find it encouraging. Instead, they find it othering. “And please, please don’t tell me how your sister in law, cousin, neighbor’s cousin had the same thing and was cured by such and such……or that you now sell some miracle product that absolutely cures/improves what I have.” The person with a disability or chronic illness is the expert in their own condition. Talking as if you know more than they do about their condition or how to treat it is insulting. On the other hand, don’t assume that a disabled person needs help if they haven’t asked for it. Disabled people know their own abilities and their own needs. A disabled person may need to sit when everyone else stands, or remain standing when others sit. They may not be able to make a prostration. They may need to drink water during the Liturgy. They may need to wear dark glasses indoors. They may need to bring their own food to coffee hour. They may not tolerate loud noises. They may ask you not to touch them. It doesn’t matter whether they’re a child or an adult. It doesn’t matter whether they look disabled or not. They don’t do these things to attract attention. They’re not being disrespectful. These are things that their condition requires. By accepting people without judgment, and encouraging others to do the same, you’ll be creating a parish where disabled people feel welcome. The people with disabilities who attend our parishes want to be treated with courtesy and respect, just like anyone else. But courtesy and respect are the minimum that we should offer. To go beyond that, think about how you might be a blessing. When a disabled person is away from church, consider calling them or texting them or sending them a card. Let them know you missed them. When they’re at church, let them know you’re glad to see them. If other people complain that it’s too difficult or too expensive to accommodate disabilities (and, sadly, that sometimes happens), speak up. Make sure it’s clear to others that people with disabilities and chronic illnesses are welcome at your parish. Celebrate the joy of Pascha through the magic of a book: Catherine’s Pascha.